(Scroll down for video) The doctors finally figured out why everything in their offices was missing. An elderly woman who seemed to be visiting many doctors in the past six months was indicted for robbing them instead. 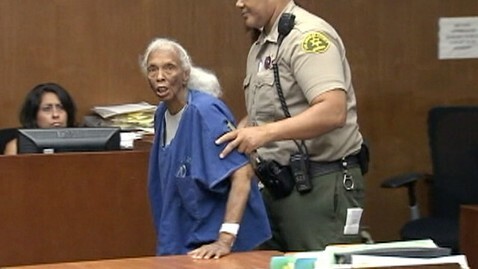 82-year-old Doris Ann Gamble, was arrested in El Segundo, California, and charged with stealing about $17,000 from various medical offices, according to Torrance, California, police. Gamble allegedly defrauded medical staff by hiding out in the offices until it closed at night, and then she robbed the cash drawers. According to Sgt. Robert Watt of the Torrance Police Department, Gamble allegedly had a pattern of theft in the offices of doctors and she has been previously convicted in 2010. Police noticed an increase in commercial robberies once she was released. Torrance detectives noticed a distinctive senior female with gray spiky hair in the lobby, stealing from an office when reviewing video surveillance and monitoring a local motel Gamble was staying at, Watt said. Gamble had recently been living in motels, he said. Police charged Gamble with seven counts of second-degree commercial burglary and one count of attempted commercial burglary. Gamble was outspoken in her first court appearance on the charges, asking the judge why the cameras showed up to record her court appearance, according to the news media. "Why the movie, I'm not newsworthy. I'm an 82 year old, who robs, why is this newsworthy," she told the judge. On leaving the court, she made a request for donations to buy snacks while she is in prison, according to the report. Gamble has a history of theft, including a rap sheet of 21 pages and a stint last year in state prison. Bail was set at $260,000. If convicted, she faces more than five years in the county jail. Unfortunately your browser does not support IFrames.